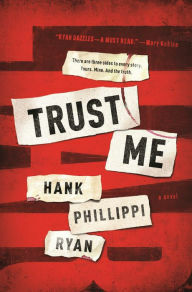 Up until the last 3/4 of Hank Phillippi Ryan's Trust Me, I was going to rate it a very solid 4 out of 5. 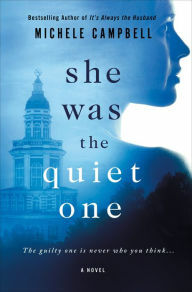 It kept me turning the pages long into the night, and I really enjoyed Ryan's writing style. Then it promptly took a turn and got very confusing, so while I didn't like the ending, I loved the process of getting there. Mercer Hennessey is a writer trying to pick up the pieces of her life after a devastating car accident killed her husband and young daughter. She agrees to a book assignment to follow the murder trial of Ashlyn Bryant, accused of killing her daughter and dumping her body in Boston Harbor. Everyone assumes that a guilty verdict is a no-brainer, and Mercer will have a huge bestselling hit on her hands. But as Ryan constantly reminds us throughout Trust Me, the truth isn't always the "truth." It is at this point that the novel becomes repetitive and hard to keep up with all the convoluted twists and turns. Ryan definitely knows how to create suspense, and she is a supremely talented writer. Trust Me threw me off-balance quite a bit though (and not always in a good way), so that is why I removed a half a star. 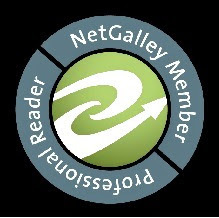 The thoroughly researched Rise Up! comes from Chris Jones, chief theatre critic of the Chicago Tribune. 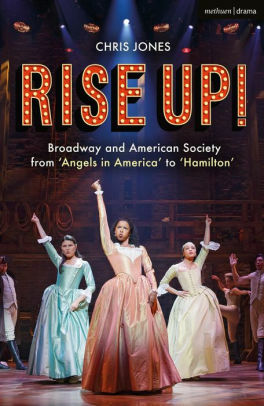 In it, Jones explores the sociological and political ramifications throughout the history of Broadway, showing a direct line from Angels in America to Hamilton. So often, Broadway can be seen as a mirror of ourselves and what is happening in society. As Jones says about Hamilton, people come out of the theatre inspired to take on the challenges of their own lives. He also discusses how Angels in America helped people understand the AIDS crisis and how Broadway became a solace after the horrors of 9/11. More issue-heavy works such as Spring Awakening and of course, Rent, are also explored. All this being said, Rise Up! is not without its problems. The writing really rambles on at times without cohesion. It also seemed that no matter which play or musical Smith was describing, he couldn't help comparing whatever it was to Hamilton. However, if you can read through the minutiae, Rise Up! is an enjoyable book for theatre lovers. Labels: Chris Jones, Rise Up! 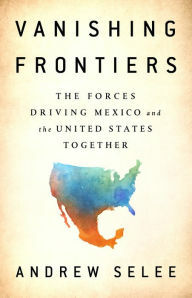 Andrew Selee's Vanishing Frontiers discusses the relationship between the United States and Mexico and how the two countries have drawn closer in a time when the building of walls is talked about. Selee has a direct perspective on this, as he is an American who has spent much of the last twenty years living in Mexico. From businesses (the bread you eat may be from a Mexican-based company) to entertainment to food, Mexico has become a stronger influence and economic force in American life over the past 50 years. Bridges were literally built to draw two border cities together while in another set of border cities, there is significant cooperation around law enforcement. Vanishing Frontiers talks about the impacts of American investment (and Mexican immigrants sending cash back south of the border) in improving the quality of life in Mexico, as well as how Americans of Mexican ancestry have returned to Mexico to start businesses, raise families, or retire due to a lower cost of living compared to here in America. Vanishing Frontiers reads in large part like an advertisement for continuing to draw closer to Mexico. While the book goes to significant lengths to discuss the steps the two countries are taking to address problems of corruption and drug-related violence that plague Mexico, the book also stresses the many positives of what is going on in Mexico that we do not hear about from journalists. In an era when we tend to focus way too often on negative news coverage or shouting matches of pundits on television, it’s refreshing to read a reasonable discussion on the economic, political, and societal relationship between the United States and Mexico. For most people, it would be impossible to fathom the life that Tara Westover has had. Her descriptions of her family life in the mountain are raw and detailed but true, and I found myself both wanting to turn the pages quickly but dreading what might be coming next. Westover was born into a survivalist family who didn't believe in school or modern medicine. In fact, there were many serious accidents the family had over the years, and the major injuries were, for the most part, treated at home. Westover doesn't mince words describing the extent of the injuries, nor the abuse she suffered at the hands of her brother. 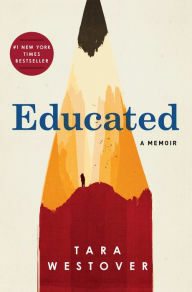 On the few occasions she left the mountain, she saw what she was missing in the world, including getting an education. What transpires is Tara's amazing story of grit, determination, and family estrangement -- a story that would lead her to the world's finest schools to eventually obtain a PhD. The most shocking sentences happen toward the end of Educated: "My family was splitting down the middle -- the three who had left the mountain, and the four who had stayed. The three with doctorates, and the four without high school diplomas." Westover has created a real page-turner here; as you read it, you have to keep reminding yourself that it's all true. Sarah Kessler’s Gigged is all about the changing job landscape and the rise of what is termed the “Gig Economy.” If you have utilized Uber, hired someone to do a task on Upworthy or Taskrabbit or employed a local pet sitter, chances are you have encountered someone who works (and lives) in a gig-based job. Kessler tackles the rise of the gig from a Silicon Valley and New York City dominant perspective and shares insights into the challenges and pitfalls it has on many workers throughout the country. Much of Gigged discusses the rise of several different organizations - Uber, Managed By Q, Taskrabbit, and Mechanical Turk - and the individuals that were contracted out by these companies or involved in their beginning. Each story uniquely captures the successes and failures of the gig world, showing how, for the few who made it work, there were many others who struggled or fell further behind in the rat race of the 21st Century economy. The stories largely center on big city America, venturing slightly into the heartland for one rural take. They also range from deep inside the company to the driver on the street - all showing the reality of many workers who are struggling to adjust to the changing employer-employee relationship. Kessler employs a lot of political commentary. In today's charged political atmosphere, there were points that didn't seem beneficial regarding employment in the 21st Century. Some topics (such as the decline in union participation) were important to talk about. Personal opinions on politicians and weaving in the topic of privilege were not. Another missed opportunity was the gradual (and increasing) role that part-time work had in such sectors as retail and hospitality prior to the development of the gig economy. 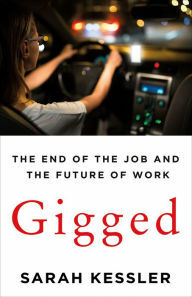 While Gigged provides a solid analysis of the rise of gig work and the struggles workers face, it missed the mark in a few key areas.